Universities are in the business of transforming lives through ideas. City University New York (CUNY) has taken that vocation one step further. CUNY, an institution of 23 campuses spread over the NYC metro area with more than 250,000 students, wants to transform attitudes about people with disabilities. At the same time, a particular CUNY program has very concrete aims: to educate the frontline workforce and create career opportunities for people with disabilities and those who serve them. The vehicle for both transformations is the Disabilities Studies Program, offered by CUNY’S School of Professional Studies (SPS). 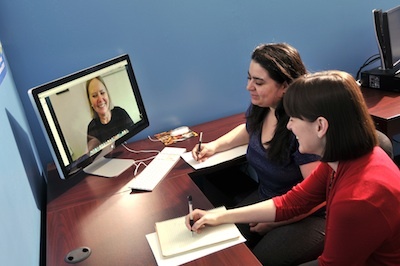 In 2013 CUNY SPS will offer the nation’s first online master’s degree program in disability studies, along with existing Online Bachelor’s Degree and a Graduate Certificate programs in the same discipline. The program is designed to offer and opportunity to explore the relationship between society and disability to help students gain a broader view of the issues they encounter on a daily basis. The program combines multidisciplinary perspectives on disability with coursework designed to spark innovation. Graduates of the program have the potential to develop new policies and new approaches to disability barriers. Program participants develop tools to help transform obstacles into stepping stones, taking people with disabilities to higher levels of achievement. The online master’s degree program has its roots in the activism of a presidential family. Mariette Bates, Academic Director of Disabilities Studies, explains: “Twenty-four years ago … John F. Kennedy, Jr. was challenged to do something positive in the disability field here in the city. In 1989, after researching needs in the field, he decided to focus on the needs of the frontline workforce. He worked with Bill Ebenstein, now CUNY’s University Dean for Health and Human Services, to develop courses on CUNY campuses for those target workers serving individuals with disabilities. 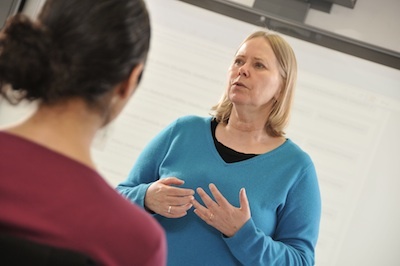 Mariette Bates, Academic Director of the CUNY Disabilities Studies program, teaches a class. Kennedy also created a fellowship for CUNY students who work in the field. Kennedy Fellows receive a scholarship and mentoring opportunities. In the past two decades the program has selected over 800 students to become Kennedy Fellows.Bates taught a course on Introduction to Developmental Disabilities in the early days of the program and served as a mentor to Kennedy Fellows. In 2003, CUNY created the School of Professional Studies to further the education of working adults in New York City. The Disability Studies Program began at the newly created school with a graduate certificate in 2004. The Master’s Degree began as a face-to-face program in 2009. In 2012, CUNY SPS created the Online Bachelor’s Degree program for people who need to finish college. The Master’s Degree is coming online in the fall of 2013. Online courses provide flexibility to students who self-identify as having a disability and therefore might be better able to complete the courses in the comfort of their own homes and with their own adaptive computer equipment. In addition, workers who cannot attend school face-to-face because of family responsibilities have another option to finish their degree. Because the program had such strong ties to service agencies, about 75% of the students in the MASTER’S DEGREE program already work in the field in some capacity. About 15% of the disability studies students self-identify as having disability. The Bachelor’s Degree, Master’s Degree and Graduate Certificate programs are open to all who meet certain educational requirements, described below. The Kennedy Fellows program is administered by the Office of the Dean of Health and Human Services and has specific requirements for applicants. Limited scholarship aid is available at all levels for qualifying students. People from other CUNY disciplines such as the School of Social Work or the rehabilitation fields often come to the program to learn more about disability in the four course advanced certificate program with a goal of transforming perspectives in their fields. The program should leave a lasting legacy to improve the working lives of people with disabilities. “One of the things I value about these programs,” says Bates, “is that they have the power to transfer that knowledge and energy to future generations.